By LUDWIG VON KOOPA - These are the metrics Nintendo will understand. January 12, 2017: During THE Nintendo Switch Presentation, the famous one that introduced the Switch in great detail with its hardware philosophy, they announced in the first five minutes that online play will be a paid service releasing in Fall 2017. January 17, 2017: Nintendo's Switch online service page becomes available, where I describe it as less services at a higher cost. I noted Nintendo never promised to establish online infrastructure with this service, and they may just pocket the money. June 5, 2017: Nintendo Switch Online is delayed to 2018, and the pricing model of $20 a year is revealed. May 10, 2018: Nintendo Switch Online has been announced to launch September 2018, and they now say there will be cloud saves. May 15, 2018: Details on the family groups that you can establish to share Nintendo Switch Online with you and seven other people become clear, as you can now create your own groups. KoopaTV made one. Family plans are $35 for a year for the entire group. It was made pretty clear that Nintendo considered the free online gameplay we've been experiencing with the Nintendo Switch for the past year and a half to be a “free trial” that we'll now be paying for. No promises of online infrastructure or an improved experience. 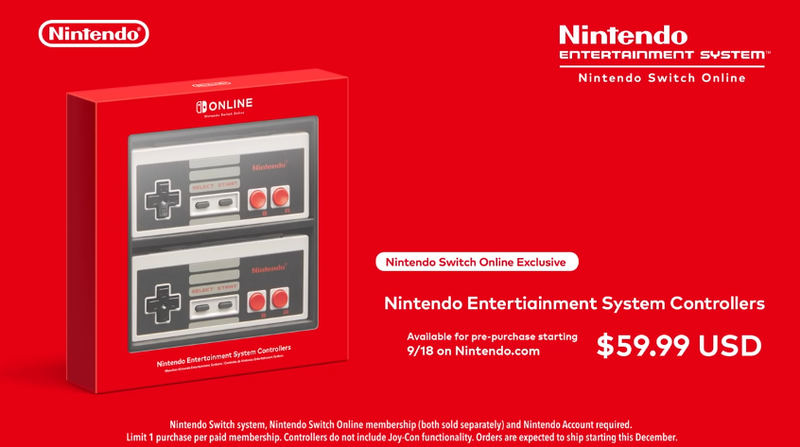 You'll get NES games that no one cares about or wants to play; cloud saves of limited value and scope; and access to really bad “special offers” like NES-styled controllers for $60 that you can't use for normal Nintendo Switch games since they aren't normal Joy-Cons and exclude Joy-Con functionality. Nintendo didn't even bother to spell “Entertainment” correctly. That's how bad this one is. You may recall a month ago I wrote an article that was based on a speech that Shigeru Miyamoto gave, about how the gaming industry should embrace the subscription model more. If that is the kind of shift that Nintendo will be taking, and subscription offerings with little value for the customer is how Nintendo will be taking that shift, then Nintendo Switch Online is absolutely something that everyone should be concerned about. It's a trial for Nintendo that will determine how they approach their pricing strategy for future products, and it will determine just how little value they can put into those products. People who want to downplay just how despised Nintendo Switch Online is will say things like, “Well, it's cheaper than the other competing consoles,” or “You're complaining about $20? What are you, a child who can't get his mommy to buy it?” or “Don't like it? Don't buy it.” Everything those people are saying is counterproductive. Here's how you actually get the message across to Nintendo that Nintendo Switch Online is a bad value, and why “don't buy it” doesn't get the message across. Nintendo knows the total number of Nintendo Switch Online subscriptions they can sell — the equivalent of how many Nintendo Switch consoles they have sold. A metric Nintendo will be paying attention to is how many people are subscribed to Nintendo Switch Online versus how many people own a Nintendo Switch. It's a percentage, and if that percentage isn't meeting their predictions, then they won't attribute the blame to Nintendo Switch Online as a product offering. They'll blame their marketing efforts — marketing is at the very beginning of the buyer's journey. 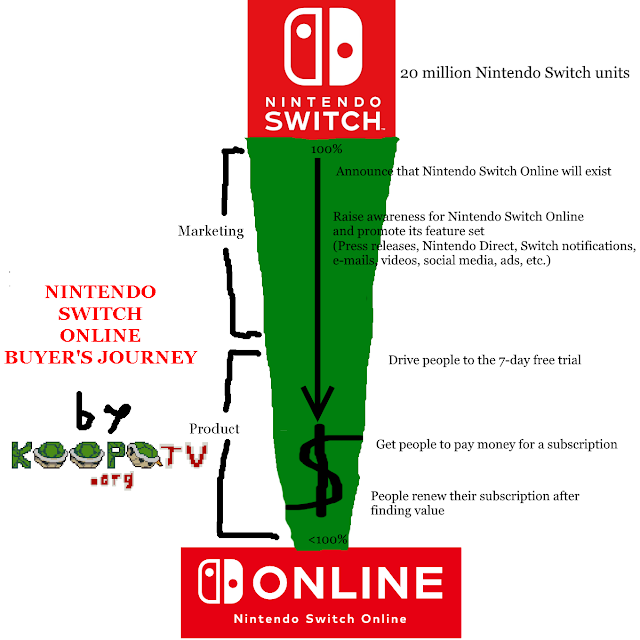 Marketing isn't doing a good enough job of making people aware of Nintendo Switch Online, or they don't understand the benefits. Rather than change the product, they'll punish their marketing department. Just like how if a videogame doesn't sell, they don't change the game but blame marketing. The rest of this article is just explaining the Nintendo Switch Online Buyer's Journey and how you play a role into it. If you understand it, great! If not, read the explanation below. By the way, be on the look out for Nintendo to inundate you with advertisements about Nintendo Switch Online — Nintendo Directs, videos, tweets, Nintendo Switch notifications, e-mails, their website, paid online advertisements, brand ambassadors pleading with you that it's great... You name it. Another metric Nintendo will be observing is the statistics around the 7-day free trial they'll be offering. I don't know enough about this trial to go into that much detail (as of writing, no one knows about it), but there are two conversion rates that Nintendo cares about: How many people enter the trial compared to how many people have a Switch (their marketing efforts, mentioned above, are likely to get people to try the trial first before going straight into a purchase), and then how many people buy a subscription after trying the trial. “One free, seven-day trial per Nintendo Account is available through Nintendo eShop on Nintendo Switch. This is all the direction given. The low quality isn't my camera's fault — it's actually that bad in the eShop. Finally, you can buy a Nintendo Switch Online subscription and then not renew it. (Again, be sure to turn off automatic renewal.) Nintendo will, of course, be tracking what percent of people don't renew their subscription (also referred to as “churn” in subscription economics). If they have a large churn rate, that can only tell them one thing: Given the choice between paying for Nintendo Switch Online for another time period and indulging in all of its alleged value versus wanting nothing more to do with it, you chose the latter. For having got to the stage of choosing not to renew, you've already demonstrated to Nintendo your willingness, ability, and commitment to pay for an online service, but after having experienced it for a month, three months, or a year — the full product and all it has to offer for an extended time period — you decided it ultimately was not worth your money. That's the ultimate rejection of Nintendo Switch Online that you can provide to Nintendo in a way that's financially recognisable to them. Believe me, Nintendo's finance guys and executives will be tracking the churn rates and adoption rates of Nintendo Switch Online very closely. They've talked Nintendo Switch Online up to their investors and the stock market, and they need to deliver. If everyone who feels that Nintendo Switch Online is a bad value doesn't convert off the trial or doesn't renew their subscription, that will affect change much more than dumping Dislikes on Nintendo's marketing will do. Ludwig knows how subscription-based companies evaluate the success of their offerings through real-world experience working in one, so he knows what he's writing about in this article. The rest of KoopaTV's staff doesn't even want Ludwig to start paying for the Nintendo Switch Online KoopaTV family group out of protest for how bad Nintendo Switch Online is, and he's happy to retain his money. Still, he'll have to pay for it by the end of October because it's the prize of Round 22 of the KoopaTV Loyalty Rewards Program. That means that you can join KoopaTV's family group and get a one-year free ride for Nintendo Switch Online, all for winning a 100%-skill-based contest! Ludwig has revealed the manner in which he'll be using his free trial, but since it ultimately will convert into a family plan, he's acting contrary to this article. And so the family plan begins. Governments wish to force Nintendo and other online providers to change how these work. Excellent article . I knew this was a long time coming from Nintendo but I never realised how close it was . A certain era is definitely ending I fear . Dread it. Run from it. Nintendo Switch Online still arrives. Slimy, scummy, used by literally every subscription video service I've ever encountered...yeah. NOT a book I'd have wanted Nintendo to take a page from. And that's an interesting take about the marketing stuff. I do have to wonder how true it really is. Still, just because it's standard to screw consumers doesn't make it right. Believe me, executives love to blame the marketing department first before taking responsibility for their own unpopular decisions.